Children are great explorers, and preschool children spend much of their time exploring at home. This can lead to children unintentionally being exposed to a number of hazardous substances. This article describes some of the common household poisonings, outlines their management and discusses their prevention. Exposure to cleaning products in the home is the cause of many unintentional poisonings in children. The most frequently involved toxins are bleach, low-molecular weight hydrocarbons (e.g. some house-hold solvents), acids/alkalis, detergents and ammonia products. These products have highly variable toxicity and highly variable packaging in terms of safety. There is an emerging issue with pre-packaged cleaning products, laundry detergents and particularly dishwasher tablets, as these appear attractive to small children. Bleach is generally of low toxicity, with household solutions commonly containing less than 10% sodium hypochlorite (the active component of bleach). Children rarely ingest significant quantities as bleach is extremely unpalatable. Less than 100 mL of household bleach is unlikely to cause serious adverse effects. However, if children develop symptoms, they should be referred to hospital. Common effects include nausea, vomiting, and diarrhoea. Occasionally exposure to more concentrated bleach solutions may occur (industrial bleach may contain up to 50% sodium hypochlorite), presenting a risk of oesophageal injury (see below). Acid/alkali ingestion such as dishwasher powder, drain cleaner and oven cleaner can cause severe corrosive injury. Oesophageal injury can occur without obvious lip or oral burns. Any stridor, dyspnoea, dysphonia, drooling or vomiting suggests serious injury to the airway or gastro-oesophageal tract and the child should be urgently referred to hospital. The child should be kept nil by mouth. Ammonia solutions in household cleaners are at a concentration that does not cause corrosive injury, however occasionally exposure to more concentrated ammonia solutions occurs. These should be managed as for acid/alkali exposure. Ammonia gas is highly irritant to mucosal surfaces and may be released when an ammonia-containing cleaning solution is mixed with a strong alkali, such as sodium hydroxide in drain cleaner. The child’s eyes should be irrigated and they should be urgently referred to hospital if they have signs of respiratory irritation (cough, wheeze, stridor or respiratory distress). Cyanoacrylate adhesives have become a common household product. While exposure will not be lethal it can be both painful and distressing. Exposure may occur during exploration by child or if the glue is mistaken for an ear or eye drop due to similar packaging. Attempt to peel or roll the surfaces apart with the aid of a blunt edge, e.g. a teaspoon handle. Do not try and pull surfaces apart with a direct opposing action. If lips are accidentally stuck together, irrigate with warm water and encourage maximum wetting from saliva and pressure from the tongue inside the mouth. Peel or roll lips apart. If the eyelids are glued together, irrigate with warm water. Eyelids may then be able to be separated by rolling the lids. Otherwise trimming the eyelashes may be effective. If the eyelids still cannot be separated the recommended approach is overnight application of a wet eye patch, followed by ophthalmology review. Once the eyelids are separated, the eye should be carefully examined to ensure any fragments of glue are removed and corneal abrasion is excluded. Treat any corneal abrasion with chloramphenicol 0.5% eye drops, one drop, four times daily, for seven days, to prevent secondary infection. Ideally, children with corneal abrasions should be reassessed in 24 – 48 hours, and referred for review if the abrasion is not healing. Nail-polish removers can be composed of a number of different products, including ethyl acetate, isopropanol and acetone (now less commonly used). The management of nail polish remover exposure is supportive. Charcoal is not recommended. If children are asymptomatic two hours after ingestion then no further treatment or follow up is required. Children with CNS symptoms should be referred to hospital. Ethyl acetate has a local irritant effect to the skin, eyes, and mucous membranes that develops rapidly. If no symptoms occur over the first few minutes then exposure is likely to have been minimal. Only large ingestions result in systemic symptoms (gastrointestinal and CNS), and these symptoms are also likely to occur rapidly. Isopropanol toxicity can cause CNS effects. Ingestion is best managed by observing the child for altered mental status. An observation period of two hours post-ingestion can be used to rule out clinical toxicity in paediatric patients. Ingestion of small volumes of acetone can cause central nervous system (CNS) symptoms. The onset of symptoms is likely to occur rapidly but recovery may be slow. CNS symptoms may be followed by metabolic acidosis, cardiovascular compromise and coma. Any injury or disease caused by hazardous substances must be notified to the Medical Officer of Health, under the Hazardous Substances and New Organisms Act 1996. However, some medical practitioners may be unaware of this requirement. 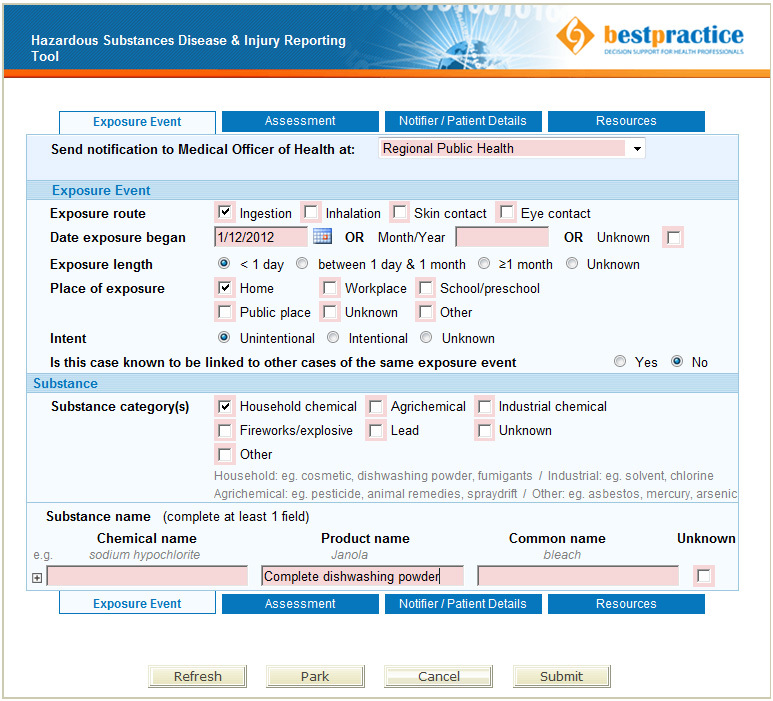 An electronic notification form is located on the bestpractice dashboard (log in at www.bestpractice.org.nz or go directly through MedTech) and look for “Hazardous Substances & Lead Notifications”. Primary care practices that do not use bestpractice Decision Support software, should inform their Medical Officer of Health of any notifications manually. Although exposure to hazardous substances outside of the home is not as frequently implicated in unintentional child poisonings, a number of products used in the garage and garden present a risk. Ethylene glycol is rapidly absorbed and signs and symptoms similar to ethanol intoxication develop within four hours of ingestion (nystagmus, drowsiness, nausea and vomiting). Cardiorespiratory features may develop, leading to shock, seizures, coma and renal failure within several hours. All symptomatic patients, as well as those patients in whom exposure level is unknown, should be referred urgently to hospital. Patients with significant ingestion will develop metabolic acidosis. Patients presenting with unknown exposure level who have a normal bicarbonate level and a normal examination at four hours can be safely discharged. Children with minor ingestions of ethylene glycol, e.g. a witnessed small taste, sip or a lick, do not require hospital evaluation and can be observed in the community unless symptoms develop. Brief skin and inhalation exposure does not result in ethylene glycol intoxication. Skin exposure can be managed with soap and water. Ocular exposure should be managed with removal of contact lenses and irrigation with tap water at room temperature. This is usually sufficient; children with persistent ocular symptoms should have a formal ophthalmology examination. Ingestion of a small amount of petrol usually results in mild transient nausea and vomiting which can be managed in the community with observation. Administration of fluid “to dilute” or induce emesis, is not recommended due to the potential to further increase the risk of pneumonitis. Pneumonitis can be associated with ingestion and evolves over a few hours. Persistent coughing, gagging and respiratory signs may indicate aspiration and these patients should be observed in hospital. Systemic CNS toxicity with onset of CNS depression, seizures and possible death within one to two hours can occur with larger ingestions/inhalations (usually >1-2 mL/kg). These patients require emergency transport to hospital. Fortunately such ingestions/inhalations are uncommon in unintentional poisonings in children. However, intentional “huffing” of petrol has resulted in deaths in New Zealand, and parents, caregivers and young people should be aware of the risks associated with this practice, and access appropriate support if needed, such as mental health or youth counselling services. Dermal exposure to petrol should be decontaminated with soap and water. Ocular exposure should be managed with removal of contact lenses and irrigation with tap water at room temperature. This is usually sufficient; children with persistent ocular symptoms should have a formal ophthalmology examination. Common domestic rodenticides use long-acting anticoagulants or “superwarfarins” such as coumatetralyl, bromadiolone and brodifacoum. A child who has unintentionally ingested a single pellet does not require INR testing or medical review. Parents should be advised to seek medical attention if the child develops mucosal bleeding or bruising. Children who have ingested larger amounts of rodenticides should be evaluated for coagulopathy; it is estimated that a child needs to ingest > 30 g of a 0.005% (a standard concentration) preparation as a single dose to cause significant anticoagulation. Cholecalciferol (vitamin D3) is also commonly used in domestic rodenticides and medical assessment is not required for single unintentional ingestions in children. Evaluation should occur if symptoms of hypercalcaemia occur. Glyphosate is present in common domestic herbicides, such as some Roundup, Zero Weedkiller and Weed Out products. Ingestion of diluted preparations causes little concern other than mild gastrointestinal symptoms. Ingestion of concentrated preparations can lead to gastrointestinal symptoms (nausea, vomiting, diarrhoea and abdominal pain) as well as oropharyngeal/oesophageal erosions, aspiration pneumonia and hypotension. >300 mL – potentially fatal. In children risk stratification based on dose is less specific. However, children with minor ingestions do not require hospital assessment unless symptomatic. Dermal exposure causes local irritation but not usually systemic toxicity. The skin should be decontaminated with soap and water; medical review is required only if the child is symptomatic. Ocular exposure should be managed with removal of contact lenses and irrigation with tap water at room temperature. This is usually sufficient; those with persistent ocular symptoms should have a formal ophthalmology examination. Herbicides containing substances other than glyphosate are also available and care should be taken to read the label of the product ingested, and if necessary, information sought from sources such as the National Poisons Centre or the TOXINZ database (www.toxinz.com). Not all products from the same manufacture contain the same ingredients, further emphasising the need to read the label of the product ingested carefully and to confirm its exact name. N.B. glyphosate should not be confused with organophosphate poisoning, which is a separate toxidrome. As new products are manufactured, packaged and purchased, further hazards in the home will emerge. Identification and prevention of injury to others requires notification of these events to the New Zealand National Poisons Centre and the Ministry of Consumer Affairs, as well as a Medical Officer of Health. Bronstein AC, Spyker DA, Cantilena LR Jr., et al. 2006 annual report of the American Association of Poison Control Centers’ National Poison Data System (NPDS). Clinical Toxicology 2007;45:815–917. Caravati EM, Erdman AR, Christianson G, et al. Ethylene glycol exposure: an evidence based consensus guideline for out-of-hospital management. Clinical Toxicology 2005;43:327-45. McKenzie LB, Ahir N, Stolz U, Nelson NG. Household cleaning product-related injuries treated in US emergency departments in 1990-2006. Pediatrics 2010;126:509-16. Murray L, Daly F, Little M, Cadogan M. Toxicology Handbook. Churchhill Livingstone, 2007. Reddy SC. Superglue injuries of the eye. Int J Ophthal 2012;5:634–7. Riordan M, Rylance G, Berry K. Poisoning in children 4: Household products, plants, and mushrooms. Arch Dis Child 2002;87:403-6. Stremski E, Hennes H. Accidental isopropanol ingestion in children. Pediatric Emergency Care 2000;16:238-40.